I almost managed to create a latex document from a Confluence wiki, the most interesting case is processing a whole space. There are still pending issue however for instance the resulting table of content and index is problably better than the one present on the "one page" pdf version of the user guide. Chapters (pages) are arranged in parts with an additional small file. I can also publish the tool than download and format the downloaded content as a latex file. Below a screenshot of a couple of pages I have formatted as test. this definitely look better than the current single-page user guide and I'd be curious to know more. Since the user guide is constantly being updated, we need to be able to re-generate the single=page guide easily and hopefully get a pdf version with as little effort as possible. download: pages content and images are downloaded into your preferred directory. format: downloaded content is processed and a .tex file is generated. This way wiki content can be formatted several time (mainly for tests) without additional downloads. Then you have to process the .tex file and generate the .pdf, this is also a one line command. The only issue you can have after a wiki update is due to the fact that I do not process all HTML elements Conflunce wiki can have but only those used by the MPS wiki, so if an update of the wiki start using a new feature/macro so far not supported the format process will at least highlight an error. Fixing the error usually requires little java and latex experience. Several Confluence macro are still not processed, but I'm working on it :-) in my spare time. If you are interested I can send you or post here the .tex and the .pdf file of several wiki pages after being formatted. 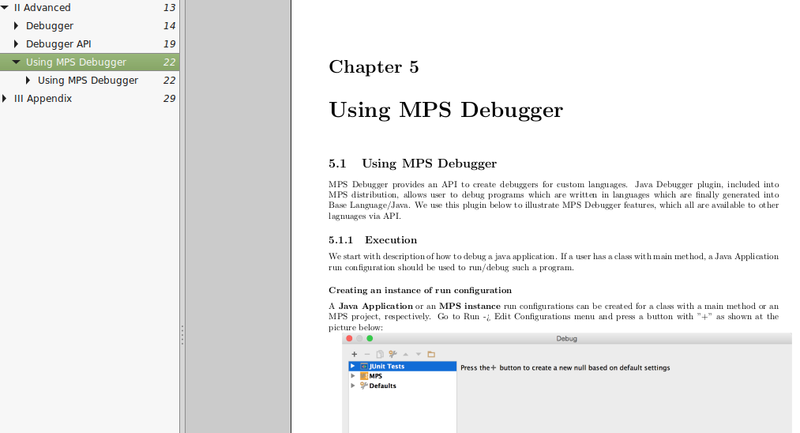 I have prepared a demo pdf with 3 parts and seven chapters, basically the top of the MPS User's Guide html page. The new forum UI does not allowed me to attach a pdf file. In case you are interested let me know how I can send the pdf. yes, I'm very curious to see the generated pdf that you have created. Would you please send me the pdf to my vaclav at jetbrains e-mail address?